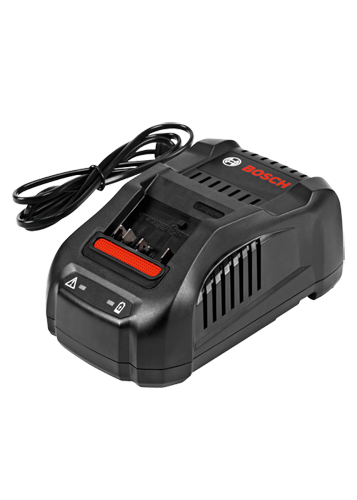 The Bosch BC1880 18 V Fast Charger gets the user power ready in a hurry. It can fully charge a spent 18 V 6.0 Ah battery in 55 minutes and 18 V 2.0 Ah SlimPack battery in 25 minutes. It has fast-charging, so that it can charge the 6.0 Ah battery to 80 percent in only 35 minutes and the 2.0 Ah battery to 80 percent in just 15 minutes. This charger was designed with battery-protection systems. One is the regulated dual-mode charge – the first 80 percent of the charging is very fast, while the remaining 20 percent is in long-life mode. Another is a cooling fan to preclude cell overheating while charging. Compatible with all Bosch 18 V SlimPack and FatPack Lithium-Ion batteries, this charger allows users of the Bosch Flexible Power System to use (with little downtime) a wide variety of powerful tools – drill drivers, impactors, reciprocating saws, circular saws, oscillating tools and more. The BC1880 provides a charging status indicator. Have a tool, accessory, application or service question? Call us at 1-877-BOSCH99 (1-877-267-2499) or visit the Frequently Asked Questions. Locate and download the parts diagram for your tool. Order your genuine Bosch parts here. Protecting your investment in Bosch power tools can save you time and money in the future.